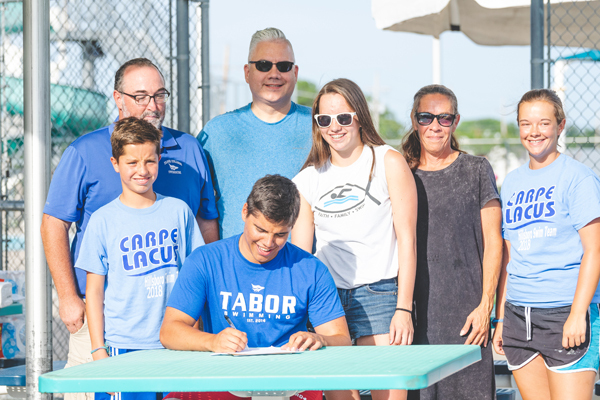 Jaden Priest, Hillsboro High School graduate, signs a letter of intent on July 15 to join the swim team at Tabor College this fall. 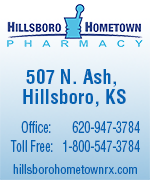 The signing took place during the Hillsboro swim team awards event at the Hillsboro Family Aquatic Center. Standing behind Jaden Priest are Nate Duell (left), swim coach at Tabor College; brother Gavin Priest; father Jason Priest; sister Macy Priest; Stephanie Moss, Hillsboro head swim coach, and Kalen Moss, assistant coach. Courtesy photo / Karrie Rathbone.